Makita don't just make handheld powertools they also produce lightweight static machines. 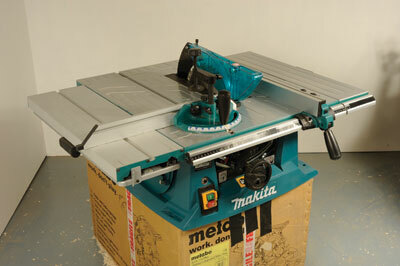 Since most of us are working in restricted workshop spaces or on site, we thought it was worth checking out a Makita table saw. 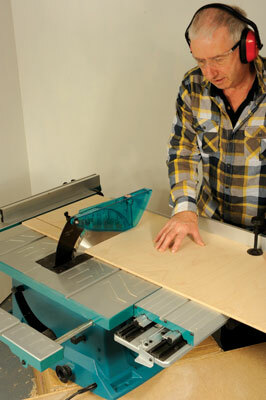 The MLT100 table saw is one of two similar machines in the Makita range. Both are relatively lightweight constructions, although this one is heavier by 8kg, according to the spec - although I'm not sure why there is this degree of difference. Both machines have a similar cutting capacity - not just in blade depth of cut of 93mm at 90° but also the size of board you can cut. The other table saw, the 2704, can apparently rip a 2440 x 1220mm board by pulling out the table extensions, and this one seems to be similarly able, although it isn't stated on their website. In fact what makes this saw stand out is the ability to handle very large boards (with help) and the sliding table to the operator's left. The mitre protractor slides easily in the main table slots but becomes tight in the sliding table slot. It then acts as a wide panel crosscutting saw. So, despite the rather light build quality of aluminium, pressed steel and a plastic moulded base, it can tackle some large scale work. The main fence can be adjusted to suit board cutting, or moved backwards for cutting solid timber. It has a front push down locking lever with a metric scale on the fence rail. The brush motor isn't quite as powerful as the 2704 model, but still enough for most tasks. The front controls are pretty conventional, allowing rise and fall and tilting the arbor up to 45° for bevel cuts. I like a saw table to be all cast iron solidity, which, of course, modern saws are not in this mode. This saw also has slightly less power than the 2704 model. Having said that, it does what you expect of it; it cuts cleanly and straight and square and handles substantial boards to boot. A competent saw table if you don't want to run to cast iron in terms of weight or cost.